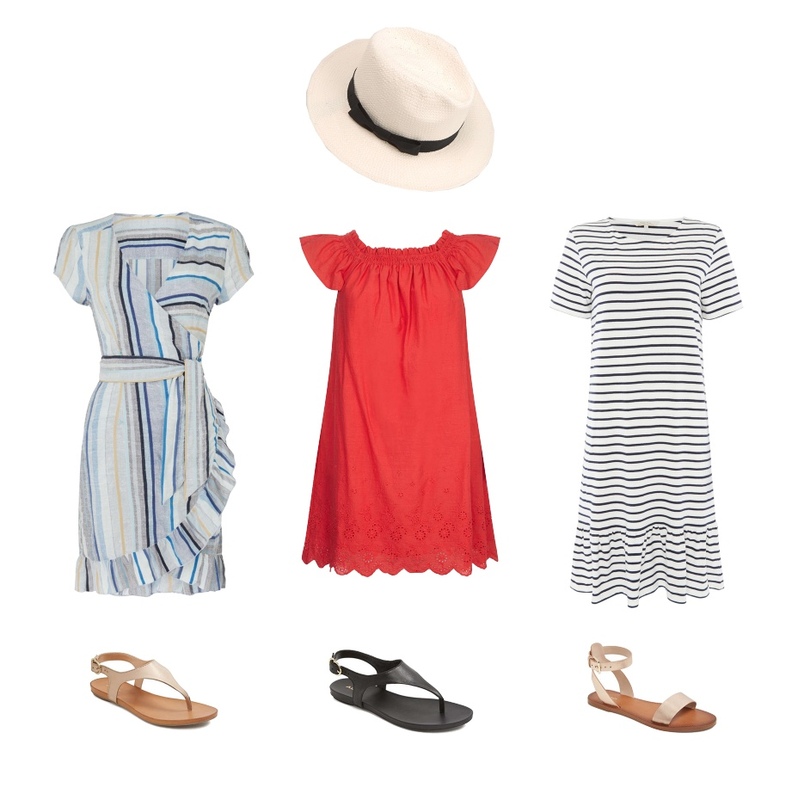 Morning ladies for this month's collaboration with House of Fraser, I thought we'd talk summer dresses. Something that if the weather is kind to us this summer we'll all be wearing a lot of. So let's take a look at my top picks. 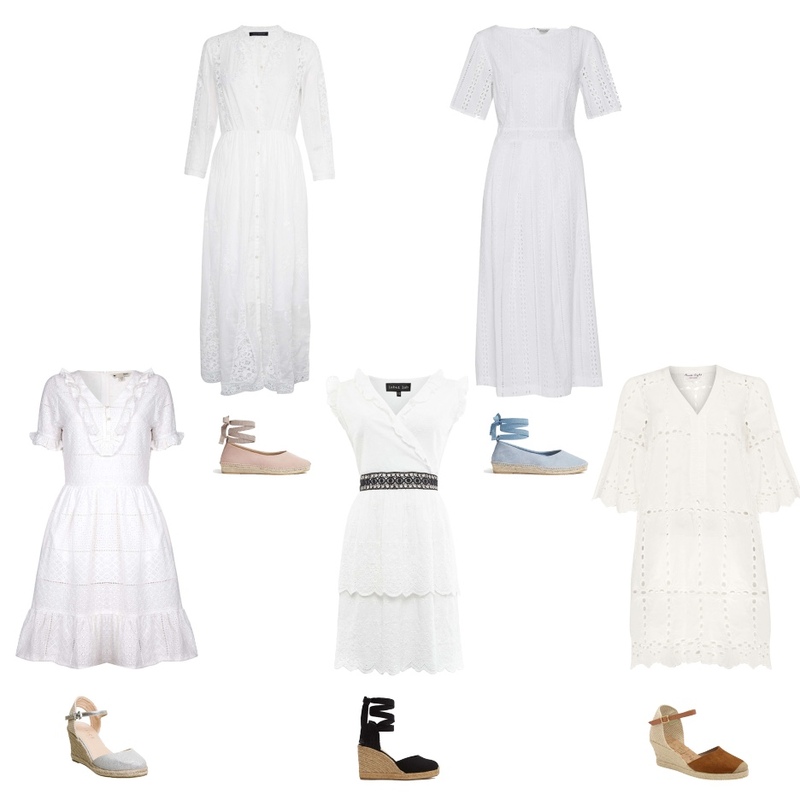 Starting with simple white/off white summer day dresses that are ideal for pairing with sandals or trainers & a denim jacket should the weather be a little cool. Timeless dresses that you'll find yourself reaching for year after year. Then of course there's the ever useful white summer dress, which similar to pretty white tops, you'll never own enough of! I have a huge weakness for a frill/ruffle/broderie anglaise so I'm never going to be able to resist adding a new addition to my collection & the above 5 beauties are proving very hard to resist! 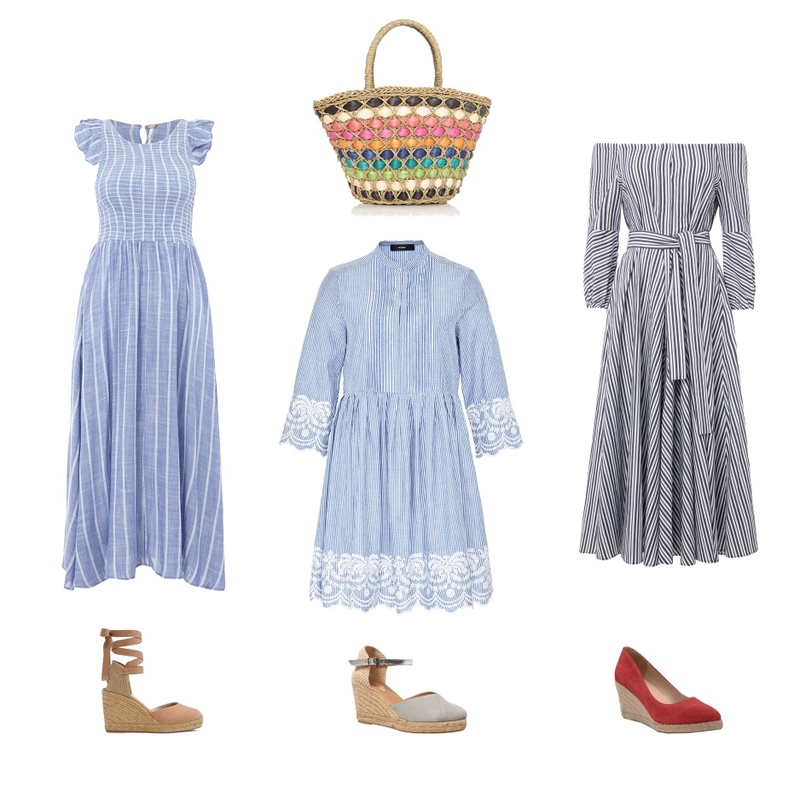 Moving onto some colour now with these stripe chambray dresses that like white dresses will prove timeless & look so fresh when paired with sunkissed skin. Or if colour is more your thing then you'll love the above pretty broderie bardot sundress & fellow stripe addicts will no doubt be tempted by either of the above two beauties. 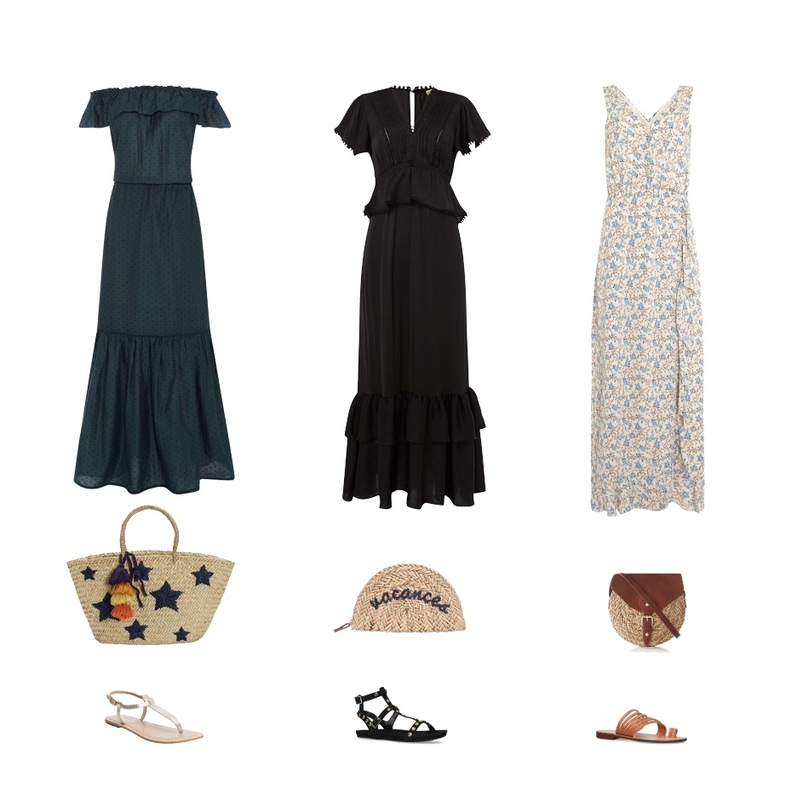 In my book maxi dresses are always a good idea - pair with sandals if the weather allows or throw on a pair of trainers & biker/denim jacket on cooler days. Plus if you live in jeans 99% of the time it's lovely to occasionally waft around in a floaty number. And finally of course a dress is a great way of incorporating a little bit of pattern into your wardrobe. Team with a biker jacket or blazer & you'll still feel put together in a slightly less tailored way. Talking of dresses I'm taking inspiration from today's post & wearing one of my maxi dresses, which I'm brightening up with a huge splash of red from my new tote that's a real classic. As you've probably gathered by now I get a lot of use from my red across body bag, so when I spotted this timeless tote I just knew it would be perfect for stylishly carrying round all my everyday items. Plus due to it's size & three compartments, one of which is zipped, it will make the perfect bag for travelling this summer. I've then added a studded belt to help break up the solidness of the dress & my red trim leopard print ballerinas to tie in with with my new bag. So ladies are you a fan of dresses come the sunshine? Perhaps you wear them more than trousers all year round. Or maybe there's no persuading you to ditch the jeans. As always I'd love to hear your thoughts on the dresses & looks I've put together in today's post & in the meantime you can check out House of Fraser's full dress collection here. Enjoy your day & as always I'll see you tomorrow.